Despite Myanmar’s recent transition to civilian leadership, the military has retained significant power and is most to blame for the sectarian violence against the Rohingya. State Counselor Aung San Suu Kyi has faced the brunt of international criticism for what has been described as ethnic cleansing of the Rohingya, but Myanmar’s military, which has executed the crackdown in Rakhine State, is largely to blame, says Francis Wade, a journalist and author of Myanmar’s Enemy Within: Buddhist Violence and the Making of a Muslim ‘Other.’ The military still retains a great deal of political and economic power despite the country’s recent transition to a civilian-led government, explains Wade. Still, he says that in echoing the military’s rhetoric against the Muslim minority group, Aung San Suu Kyi and her civilian government have only fueled the sectarian violence. Aung San Suu Kyi and her government have been condemned for their response to the situation in Rakhine. Is this warranted? Aung San Suu Kyi should not be the target of all blame. The security crackdown is a military campaign orchestrated by Min Aung Hlaing, the military chief. He is the person to whom blame should be primarily directed. What is interesting is that the military, as an institution, has essentially engineered itself into a position whereby it can commit such atrocities but Aung San Suu Kyi takes the blame. The military planned the multistage transition to a civilian government carefully. It announced its so-called roadmap to democracy in 2003, by which it wanted to step away from the spotlight in a way that allowed it to secure its political and economic interests. It did so by choreographing a transition in which a pseudocivilian government comes to power but holds a delicate power-sharing agreement with the military. So Aung San Suu Kyi now is in the spotlight; it’s her government that has taken the flak, but it’s the military that has executed the campaign. When we talk about where blame should be attributed, it should be the military. There is no one in power who appears either willing or able to rein in the military and stop the hate speech. But at the same time, the government hasn’t been silent; it has echoed the line taken by the military. In doing so, the government has enabled this violence to take place free of any internal condemnation. There is no one in power who appears either willing or able to rein in the military and stop the hate speech that is being directed at the Rohingya. How has the power-sharing agreement worked out thus far? The military appoints 25 percent of parliamentary seats and controls the home, border affairs, and defense ministries. Meanwhile, the civilian government, led by the National League for Democracy (NLD) party, is in a tough position, because it knows antagonizing the military would likely prompt it to make life difficult for Aung San Suu Kyi. There are areas of reform where the state counselor has succeeded to a degree, such as opening the economy, which has also benefited the military. Other progress includes allowing civilian voices in parliament and some scaling back of legislation like the Emergency Provisions Act, which allowed authorities to detain people without charge and courts to convict on thin evidence. Aung San Suu Kyi worries that if she were to upset the military then it would be harder to convince it to acquiesce to further reforms. A lot of people say that if the power-sharing agreement completely unraveled, the military would launch a coup. That is not the case, I believe. The military is happy with its current position because it’s able to deflect criticism onto Aung San Suu Kyi while retaining its economic and political interests. What role has the military played over the last several decades? The 1962 military coup paved the way for the military to assume complete power over the country. As a military junta, Myanmar was a classic authoritarian government. It controlled channels of information, it snuffed out viable opposition, and there wasn’t an elected parliament. What motivated the military to embark on the transition? No one really knows. Theories range from the military realizing it had an overdependence on China to more general anxieties about how long a dictatorship could last. The military recognized that if it got things right then it still could retain de facto power while stepping back, tricking the world into believing that Myanmar is actually a civilian democracy. That it isn’t the case, if you dig beneath the surface. There was a huge, cautious excitement among the Myanmar people as the transition began after the 2015 elections, when the NLD came to power. Now they have come to the realization that the military is in fact still in power to some extent. This is not to say that things haven’t improved in a lot of respects; they have. For example, there is a freer media. But for communities on the country’s periphery, things have become markedly worse. Conflicts that had been frozen for decades have reemerged, and the Rohingya have been stripped of whatever political rights they once had. This is an obvious sign that the democratic gains have very much been selectively conferred. It’s a mixed picture. After nearly eighteen months in power, where does the country’s first civilian government stand? It’s not particularly fragile. The military is not looking to dethrone the NLD. It would likely be happy for the current situation to continue, knowing that Aung San Suu Kyi is, to a certain extent, beholden to it. For communities on the country’s periphery, things have become markedly worse since the transition. The military is not taking the majority of criticism. It can still run free while its vast economic interests aren’t really threatened. While the transition to a civilian government has opened the economy to foreign investment and there has been a degree of progress on weakening the military’s dominance of the economy, the military is still a well-endowed institution. That is not going to change anytime soon. The civilian government knows this and recognizes that it cannot push the military too far. As international outrage grows over the Rohingya crisis, might Aung San Suu Kyi lose some of her domestic popularity? The international community sees the Rohingya as victims; domestically they are seen as aggressors. At the moment, within the country, Aung San Suu Kyi is standing firm against what she believes to be misplaced international pressure. As a result, she has been somewhat politically strengthened, whereas from the outside, she’s been described as a fallen icon, failing to champion nonviolence. It’s important to emphasize that what international critics want from her does not reflect what most of the Myanmar population wants. The violence against the Rohingya has elicited outcry from Muslim-majority countries around the world. Are there concerns that the crisis may attract the attention of international terrorist groups? What are the risks of Rohingya radicalization? 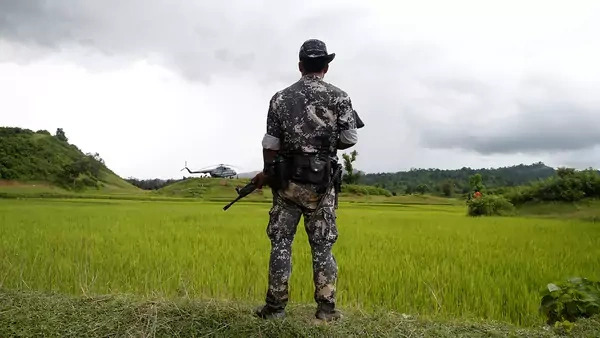 At the moment, claims of links between the Arakan Rohingya Salvation Army (ARSA), [the militant group that carried out coordinated attacks on security posts in Rakhine in late August,] and international jihadi networks are quite tenuous. There isn’t any solid evidence. We know that the leader of the ARSA was born in Pakistan and has links to Pakistani outfits, but who they are is not clear. But more than five hundred thousand people, by the latest UN estimates, have been driven into Bangladesh in four weeks. Going back to elementary conflict studies, a population that has been so brutalized and dehumanized, and denied any state protections and political rights, is a potential breeding ground for radicalization. That is not to say that it will happen, but the conditions are certainly in place to make that a real danger. There needs to be an overhaul of a culture of pervasive prejudice. There are terrorist networks in Bangladesh unrelated to the Rohingya who see in them a pool of would-be recruits. Bangladesh is also a country that lacks strong intelligence on underground terrorist groups. I don’t think Bangladeshi authorities know what to do with this influx of people. They are expanding Rohingya camps to house the new refugees, but it is just chaos. What should Myanmar and its neighbors focus on right now? The immediate concern is safeguarding and providing aid to the refugees in Bangladesh and the Rohingya who remain in Myanmar. The challenge is that mass resentment of the Rohingya runs so deep and is so toxic and combustible. It is the product of fifty years plus of statecraft by the military to create tiers of belonging in the country, with the Rohingya at the bottom and what the military considers to be a master race of Bamar Buddhists at the top. Rohingya have been cast so violently to the fringes of society that resolving this issue in a way that allows for their safe repatriation requires breaking down deep psychological and material barriers. If the Rohingya go back now, they will be subject to more attacks, because nothing has been done to destigmatize or depoliticize their identity. Something needs to be done to ensure that the population see the Rohingya as human beings, because they are not even seen as that at the moment. They have been dehumanized so successfully, and, therefore, there needs to be an overhaul of a culture of pervasive prejudice. All signs indicate that prominent government figures share the military’s antipathy toward the Rohingya. Can the United States and other countries improve the situation? The United States and other governments are realizing somewhat that the Myanmar government and military have a particular view about who should benefit from the transition. The UK has only just cut military-to-military ties, despite warnings going back years that something like this could happen, and despite the military continuing to attack civilian communities elsewhere in the country. At least that realization has finally come, and governments that supported the transition must now recalibrate their approach. They will fear that reapplying sanctions will force Myanmar back into China’s arms, but at the same time if they don’t step up diplomatic pressure on the government to allow UN teams into the country to investigate, and to punish those responsible for the violence, then they will be signaling that it can continue free of any fear of international recrimination.